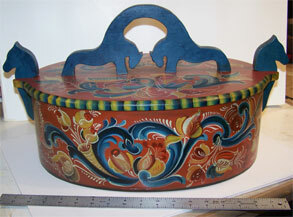 This Norwegian Rosemaled Tine was accepted for the permanent collection of the Santa Fe International Folk Art Museum in Santa Fe, NM. 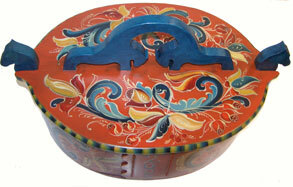 It is painted in the Old Telemark style and is backgrounded in Red Earth and lazured in Transparent Oxide Red. 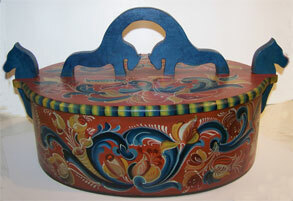 It was made by John Wahnke from Minnesota and is 18" long, 12" high and 12" wide. 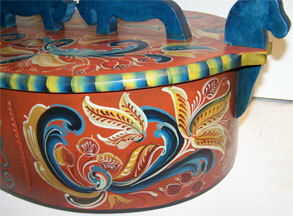 The tine has a lid with fjord horse handles and the side posts have Viking horse heads. The design was influenced by an old trunk painted in the Telemark style by Guttormsen an early Telemark painter from the 1800's in Norway.